The Irish distiller is using stout barrels to age it’s newest product. But can you tell? We had ample evidence last year that big beer wanted to be small beer. Companies like Anheuser-Busch, MillerCoors, and Constellation Brands all joined a buying spree of craft breweries across the country. It’s no wonder—craft beer in the U.S. alone is a 19.6 billion dollar market. And now even big liquor wants a piece of the craft beer pie. The venerable whiskey smiths at Jameson just released a new product called Jameson Caskmates, a version of their signature whiskey that has been aged in stout barrels. Here’s how it works: Jameson lends its whiskey-aging barrels to a nearby brewery in Ireland. The brewery, The Franciscan Well in Cork, uses the whiskey barrels to age a stout beer. Then the brewery returns the barrels to Jameson, allowing the distillers to finish their Caskmates whiskey in stout-seasoned barrels. It’s a bit like barrel-aging inception. Craft brewers often use second-hand barrels to age their beers. The idea is that the beer will borrow whiskey/gin/rum notes from the original occupant of the barrel. And it often works very well—beers like The Bruery’s Black Tuesday and Almanac’s Tequila Barrel Noir are both excellent examples of how breweries use hard liquor barrels to make unique, delicious beers. But can the opposite be true? Can hard liquor really absorb stout flavors from a barrel? Or is it a marketing ploy—just one more multinational company glomming onto the meteoric success of the craft beer sector? Appalachian State University’s Brett Taubman says that it is absolutely possible to make a whiskey that borrows flavor from a stout-seasoned barrel. “The amount of influence depends on the flavor profile of the stout, the length of time it was aged in the barrel, how much was left in the barrel, not to mention the aging process of the whiskey itself,” Taubman, an expert in brewing chemistry, says. Jameson was mum when it came to revealing these details, but according to Franciscan Well, the brewery aged its Jameson stout in whiskey barrels for around 100 days. Which is… not that long. But it’s not a preposterously short period either. Perhaps more importantly, Oregon State University’s Paul Hughes points out that “If the whiskey is relatively bland, it will be easier to detect beer flavors.” Hughes, a professor of brewing sciences, says that having a lot of stout flavor show up in a whiskey may not be such a good thing. Which leads us to how Jameson Caskmates actually tastes. 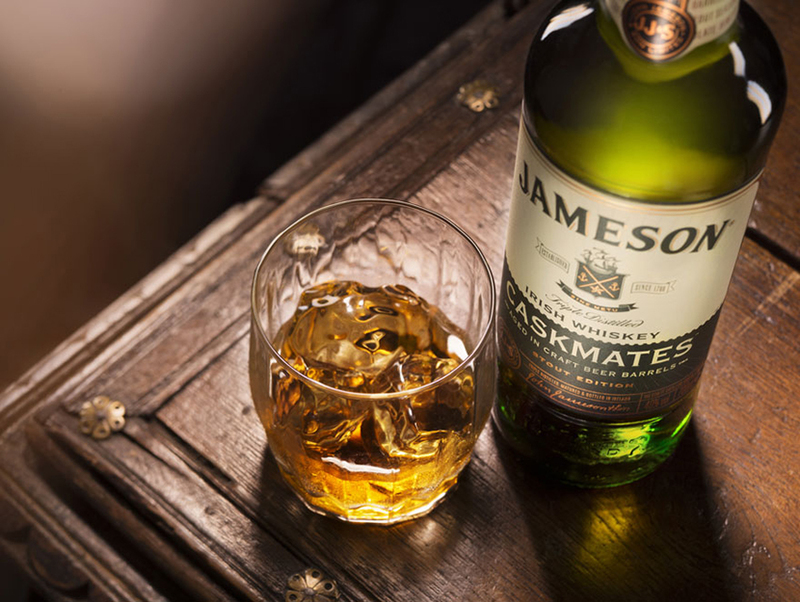 In marketing materials, Jameson says that Caskmates exhibits subtle notes of cocoa, coffee, and a hint of hops. We shall see. Disclaimer: I am a snob of the beer variety, not whiskey. But flavors be flavors, as they say (they say that, right?). Nose: Caskmates does exhibit a different aroma than the original Jameson on first sniff. The nose of Jameson original is heavy on caramel on vanilla. Caskmates gives off a very pleasant, creamy cocoa aroma. Taste: The major difference between the two whiskeys is the body. Caskmates was smoother and creamier on the palate. The flavors are largely the same, though I did pick up a very subtle dark malt flavor, characteristic of stouts, in the Caskmates. No coffee to be found, and certainly not a hint of hops. Finish: Just as the taste offers a creamier mouthfeel, so too did the finish exhibit a creamy sensation. Otherwise I detected no difference. Altogether, I must say that Jameson Caskmates is a lovely sipping whiskey. And I like the idea of craft beer playing such a starring role in a major marketing push by a respected brand. But about that whole craft beer thing – turns out that Franciscan Well, Jameson’s barrel-aging teammate, isn’t technically craft anymore. The brewery was bought by Molson Coors UK & Ireland in 2013. Perhaps the next edition of Caskmates (there are hints that Caskmates will be a series of releases) will be a bit craftier.